I am completely incapable of following the rules when it comes to food. I almost never actually follow a recipe, even when I’m baking, because I’m always tweaking flavor components and finishing methods, and I can’t remember the last time I made any sort of traditional ethnic dish the way it is traditionally made. I’ve always gotta get my little hands right down into the heart of a recipe and futz with things to get the result I want, which I suspect won’t win me any fans from the militant-accuracy set. But I don’t care. Know why? Because my food tastes GOOD. Please, please excuse my horrible photography – I’m still experimenting with my digicam and don’t have anything resembling the right set-up to take well-light or focuses photos. I can guarantee you, my next gift to myself is going to be a tripod, closely followed by the materials to make myself a lightbox. Take these enchiladas, for example. In my admittedly-non-extensive experience, your standard enchiladas are made with corn tortillas, either cheese, meat, or perhaps bean filling, and topped with a simple red chili sauce and shredded white cheese like cheddar or jack. And I like standard enchiladas. I really do. 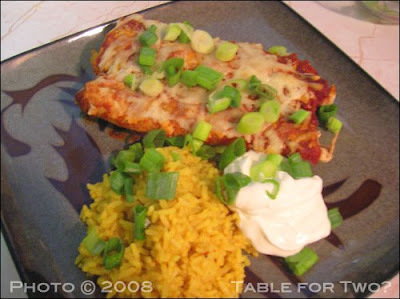 I almost always go for some kind of enchiladas when we go out for tex-mex, my favorite being the ubiquitous combination platter of one cheese, one chicken, and one bean enchilada with rice and refritos. I love me some enchiladas, I do. However, when it comes down to it, I’ve never been a huge fan of corn tortillas unless they’re in chip form. I’ve even made my own homemade corn tortillas, and while I liked them and would make them again (with the proper tool for flattening them out, anyway) they’re still just not my favorite as a yummy filling and sauce delivery system. I generally prefer flour tortillas for almost everything, but since we’ve recently been trying to replace as much of our carb intake as possible with whole grain alternatives, this time around I used some really delicious multi-grain tortillas made by Mission brands. Also, since I always like a combination of different kinds of enchiladas on my plate, I figured, why go to all the trouble to make three different kinds of enchiladas of individual fillings? I’ll just mix ’em all up in the whole batch. And then, instead of using a basic white cheese for the topping, I used a mix of a couple of sharp artisan cheeses we picked up at the Italian specialty store the week before. Once again, I’ve given my dinner an identity crisis. I’m surprised my food doesn’t grow legs and run away screaming as soon as I bring it home, just to avoid the emotional trauma. Anyway, despite all these deviations form the norm, let me just tell you that these were some seriously delicious enchiladas. J made the chili sauce from scratch, and I wish to God I was paying attention when he did because although he followed this recipe by Emeril to begin with, he changed it all over the place and I have no clue how. I really hope he can remember what he did because I want him to make some more of the stuff that I can jar and keep in the pantry for future deliciousness. The filling itself was a mixture of some smoked pulled pork that we’d made much earlier in the summer and have had bags of in the freezer ever since (didn’t do THAT the right way either because we couldn’t keep it int he smoker long enough to get that uber-tender pull-apart texture, so we had to finish it in the crock pot with some bbq sauce to finish it… I know, I know, we should both turn in our pitmaster-in-training badges) plus some cooked black beans and some of the same cheese I used to top them with. It was a perfect combination, smoky and sweet and decadently cheesy, but without the grease that always seems to accompany the cheese enchiladas I get in restaurants. The finished enchiladas tasted sinful, but really weren’t all THAT bad for you. Not healthy, but not that bad. 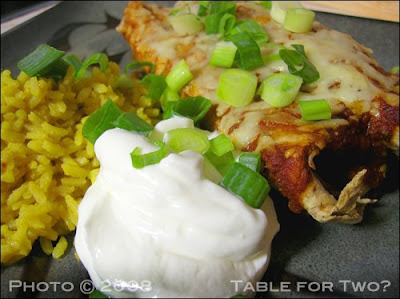 I’m not going to try to write a recipe here, because really once you have all the different components – tortillas, fillings, sauce, cheese, all of which you can alter to fit your own tastes – making enchiladas is all about assembly. Each enchilada ought to have the same amount of filling, and with a combination of fillings like I used, you want to have the same amount of each thing in each tortilla so that the flavor will be consistent. You want to pack the filled tortillas into your baking dish pretty tightly so that they stay rolled neatly and get all hot and soft and gooey when they cook. You want enough sauce both below and above the tortilla rolls so that they won’t stick or dry out, but not so much that it ends up drowning in sauce and turning into something you have to slice, because at the end of the cooking process, after the whole dish cools for maybe 5 minutes, you want to be able to lift each roll out individually to serve. I’ve learned how to achieve these things just from trial and error and having quite a few dishes of enchiladas just disintegrate when I dipped a spatula in to serve, and this time around I got it just right. We ate them with some quick homemade yellow rice (long grain brown rice cooked in chicken stock with saffron, tumeric, and chili powder) and a big ‘ole dollop of sour cream, with sliced green onions sprinkled over everything. They were perfect – warm, savory, spicy, and comforting. And I really, really wish I had some more right now. This entry was posted in Food, Drinks and Cooking, Table for Two? Archives and tagged cheese/dairy, mexican/tex-mex, pork, sauces. Bookmark the permalink.